Jon Dreyer is a Boston-area bassist. 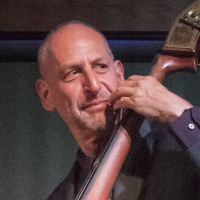 He performs regularly with jazz pianist Harvey Diamond, one of Lennie Tristano's last protégés, and with pianist/saxophonist/bandleader/composer James Merenda, both as a member of his band TickleJuice and also in more mainstream jazz settings. He has also performed with Adam Janjigian, Doug Johnson, Yoko Miwa, Hankus Netsky, Alan Rowe, Mark Shilansky, Alexei Tsiganov, Frank Wilkins, George Garzone, Grace Kelly, Roy Nathanson, Sheila Jordan, Dominique Eade, Jason Palmer, Phil Grenadier, Mike Connors, Dave Fox, Scott Goulding, Bob Gullotti, Joe Hunt, Steve Langone, Miki Matsuki, Austin McMahon, and most of the rest of the Boston jazz community. Mostly self-taught on bass, he has studied with Richard Davis, Cameron Brown, Marcus McLaurine, Harvey Diamond, and Ran Blake. He is also a mostly classical cellist. He has studied cello with Glenn Garlick, Ervin Klinkon and Ben Levinson, and as well as a master class with János Starker. He was a member of the Boston Philharmonic and the Fairfax Symphony and has performed with the Masterworks Chorale, the Kennedy Center Opera House Orchestra and the National Gallery Orchestra. All About Jazz musician pages are maintained by musicians, publicists and trusted members like you. Interested? Tell us why you would like to improve the Jon Dreyer musician page.